On a broad level we understand how planets form quite well. A disk of gas and dust forms around a young star, and clumps within this disk gravitationally collapse into planets. But there are details of this model that still pose challenges. In particular, we don’t entirely understand how small pockets of dust can get large enough to become proto-planets. 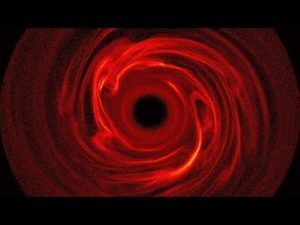 But new simulations of planet formation are beginning to solve this mystery. The basic problem with the dust-to-planet model is as follows: as dust starts to clump together, fast moving dust particles would be more likely to smack into them and break the clumps apart. Even if the clumps do hold together, the drag created by particle collisions would cause the clump to spiral inward toward the star before it could get too large. 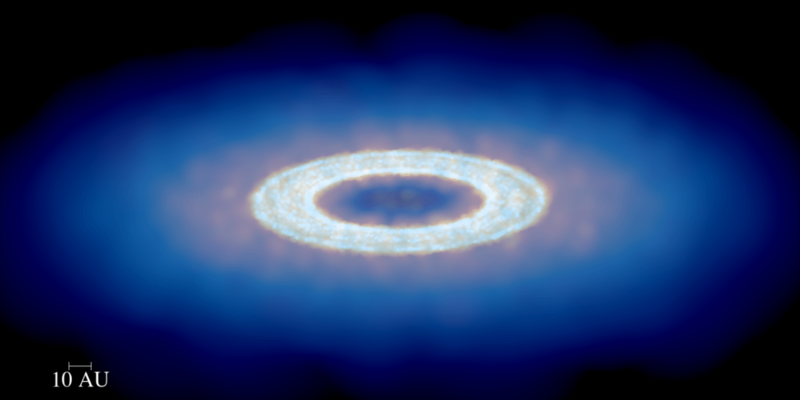 It would seem that the disk of material around a young star is a bit hostile to dusty clumps. While this seems to be an obvious problem, the interaction between gas and dust is quite complex. It turns out that a new model focusing on these interactions seems to solve the issue. When dust clumps are small, the flow of any surrounding gas will tend to push them around. This is what can create the kind of drag that causes them to fall towards the star. But when the clumps become large enough they will tend to push the gas around instead. This is similar to the whoosh of air you feel as car speeds past you. As the dust clumps orbit the star, the reaction with surrounding gas creates a pressure region that actually encourages more dust to clump together. As a result, once dust clumps reach a critical size they would tend to grow quickly rather than being ripped apart. The team that developed this model demonstrated that the process works for a variety of initial conditions, from disks that have less dust and are more diffuse to more dense disks with lots of dust. So the transition from small clumps to early planets is less problematic than we’ve thought. Paper: J.-F. Gonzalez, et al. Self-induced dust traps: overcoming planet formation barriers. Mon Not R Astron Soc 467 (2): 1984-1996 (2017). Am a bit confused about the term ‘dust’ on a galactic scale. Is this dust I could collect in a vacuum cleaner or dust we’d need Bruce Willis to sort out?